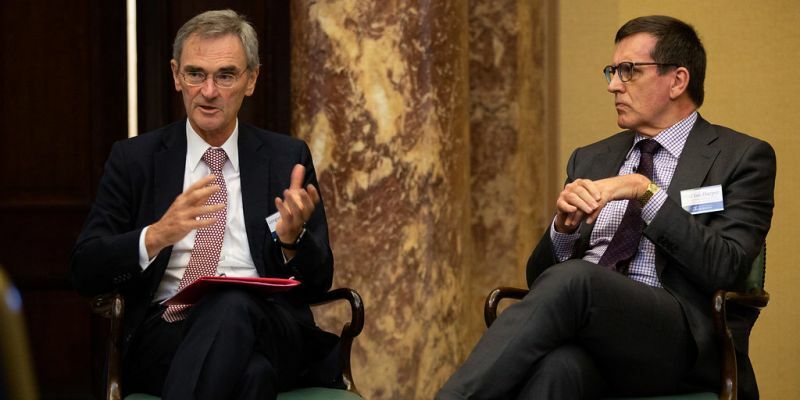 “In a way, the power of the crowd has greater influence over business than Government at the moment,” said former ASIC Chairman and alumnus, Greg Medcraft, speaking at the Business and Economics Dean’s event in London. University of Melbourne alumni attended the annual Business and Economics Dean's Event hosted by the Co-Dean of the Faculty of Business and Economics, Professor Paul Kofman, in London last week. This year’s event featured Professor Ian Harper, Dean of Melbourne Business School and Co-Dean of the Faculty of Business and Economics, in conversation with alumnus Greg Medcraft (BCom 1977), Director of the OECD Directorate for Financial and Enterprise Affairs and former ASIC Chairman, who is now based in Paris. Professor Harper invited Medcraft to reflect on the business landscape in Australia and globally. In light of the banking royal commission, public trust in the finance industry is wavering. For Medcraft, it has been a long time coming. “Three things have shaped where we’re currently at. With the advent of social media and the progression of the technology; companies have nowhere to hide. Secondly, the power and influence of the crowd - the general public - is now enormous,” said Medcraft. According to Medcraft, this perfect storm has meant that running an ethical business is no longer about simply complying with the law, but complying with what the general public deems reasonable. The global financial services industry, in particular, has been turned upside down by revelations of foul play, forcing businesses to reassess the way they previously operated. “In financial services, there was a calculation that was often done by managers. They’d assess the potential impact of breaking the law or behaving unethically - investigating the probability of getting caught alongside the severity of the consequences. If the consequence was, for instance, a relatively small fine, they often went ahead and broke the law,” said Medcraft. Drawing on nearly a decade at ASIC, Medcraft provided unique insight into what makes a company not only compliant, but profitable and responsible. “I think it comes down to culture and ethics. When I raised culture as an issue three years ago, someone said to me ‘culture is not the responsibility of the board.’ But the reality is, a business’s values are at the centre of everything and the tone is set from the top,” he said. Medcraft proposed that, despite revelations from the royal commission, culture is not something that can always be regulated. The conversation then shifted to technologies of the future, including blockchain and digital currencies. “Government-backed digital currencies are inevitable. This will change the regulatory environment. Banks may choose not to have deposit guarantees, shaking up the competitive landscape. Even tech giants like Google will be disrupted by blockchain’s distributed ledger technology,” said Medcraft. Remember to connect with your alumni network to continue to succeed in your career. Keep your contact details up to date to ensure you hear about the latest alumni events, activities and news.